SEN Plus new generation metal clad plug-in centers for each and every application. 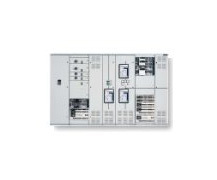 The SEN Plus, modular range of equipment with rated currents up to 4000A, is part of the extensive range of Low Voltage Motor Control and Switchgear Equipment designed and manufactured by Power Protection. The smart and simple design is fully type tested as per IEC 60439-1 and certified by an independent test laboratory (KEMA). SEN Plus cubicles which comprise of Incomers, Starters, Feeders, and Distribution are designed for flush front or back to back arrangements. An equipment zone of (height x depth x width) 2200 x 600 x 600mm forms the basis of the cubicle design, to which a cable compartment can be added for either top or bottom cable access. The construction of the SEN Plus range of equipment is fully compliant with the requirements of internal separations upto Form 4,with different options of cable termination from point of entry, using a common gland plate or individual gland plates and cable boxes for each outgoing functional unit. The system is utilising a comprehensive range of Incomers with the new type fixed / withdrawable air circuit breakers series M-Pact , switched fuses series Fulos, isolators series Dilos and the new moulded case circuit breakers series Lancelot and fast exchangeable starter and feeder plug-in units .These functional units match with the new range of IEC 947 designed ,tested and rated industrial components to achieve complete system integration. Finger proof shrouds and barriers prevent the possibility of any vertical busbar faults and provide the highest level of integrity at the heart of the design . Maximum safety level for the operator is ensured in case of reconfiguration of the equipment zone under energised conditions. The Main Distribution Panels and Motor Control Centers can be executed with a four or five phase busbar system up to 100kA-fault rating. Dust and waterproof: IP30 up to IP 54 as per IEC 529-1. Flexible and compact: Final configuration can be determined just before shipment due to "add on concept". Robust and secure: Good and easy access to all internal components. Vertical riser up to 80kAIcw/176Ipk. Service: Customising (project specific requirements). OEM documentation in 3D arrangements. Ready for the e-commerce take off: With the interactive CD-ROM you are composing and customising your own SEN Plus LV Switchgear and Motor Control Centers your self (design, calculator, general arrangement drawings and purchase order tool). Smart & simple design to meet the need in lowest investment cost: Reduced "cycle times" and installation cost due to six sigma controlled processes. Deliveries: Fast deliveries due to standardised concept. Rigid frame construction: Non welded zinc plated self-supporting construction made out of just 3 basic parts. No sharp edges. For your safety: Short circuit proof and fatigue free self-aligning stabs secure high safety level during operation. Fast and easy cabling: Through preconfigured copper links or terminal strips. Durable surface protection: Shock and scratch resistant powder paint suitable for most applications including marine and tropical conditions. Optimum accessibility and surveyability: 135 to 185 door opening angle. Control and indication.